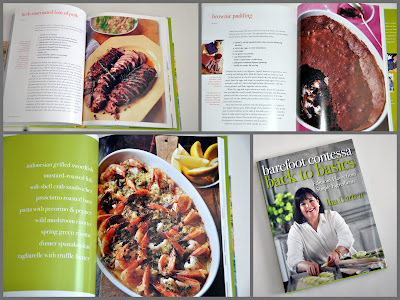 Barefoot Contessa: Back to Basics; Clarkson Potter/Publishers, New York. Just when I decided that I had collected enough recipes and cookbooks for any one's lifetime, Borders e-mails a delightful video with Ina Garten being interviewed by Andrea Robinson in Ina's new Belgian-inspired barn (her office and kitchen.) They had me with that barn, before the sticky buns were out of the oven. So here's my new cookbook. It's loaded with delicious recipes which are simple to make with ingredients you can find at any grocery store; plus sources and tips galore. The book even gives you a list of all the people who designed and built Ina's wonderful barn. I would love to meet both of these cooks!